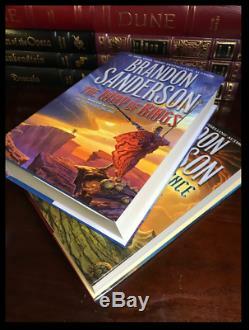 Books 1 & 2 of Stormlight Archive Signed by Brandon Sanderson. 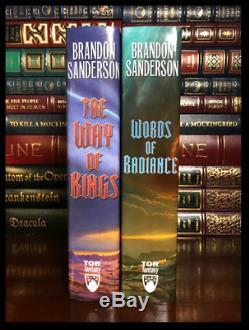 This is a brand new 1st edition hardback set of The Stormlight Archives both Signed by Brandon Sanderson. Roshar is a world of stone and storms. Uncanny tempests of incredible power sweep across the rocky terrain so frequently that they have shaped ecology and civilization alike. Animals hide in shells, trees pull in branches, and grass retracts into the soil-less ground. Cities are built only where the topography offers shelter. It has been centuries since the fall of the ten consecrated orders known as the Knights Radiant, but their Shardblades and Shardplate remain: mystical swords and suits of armor that transform ordinary men into near-invincible warriors. Men trade kingdoms for Shardblades. Wars were fought for them, and won by them. One such war rages on a ruined landscape called the Shattered Plains. There, Kaladin, who traded his medical apprenticeship for a spear to protect his little brother, has been reduced to slavery. In a war that makes no sense, where ten armies fight separately against a single foe, he struggles to save his men and to fathom the leaders who consider them expendable. Brightlord Dalinar Kholin commands one of those other armies. Like his brother, the late king, he is fascinated by an ancient text called The Way of Kings. Troubled by over-powering visions of ancient times and the Knights Radiant, he has begun to doubt his own sanity. Across the ocean, an untried young woman named Shallan seeks to train under an eminent scholar and notorious heretic, Dalinar's niece, Jasnah. Though she genuinely loves learning, Shallan's motives are less than pure. As she plans a daring theft, her research for Jasnah hints at secrets of the Knights Radiant and the true cause of the war. The result of over ten years of planning, writing, and world-building, The Way of Kings is but the opening movement of the Stormlight Archive, a bold masterpiece in the making. Six years ago, the Assassin in White, a hireling of the inscrutable Parshendi, assassinated the Alethi king on the very night a treaty between men and Parshendi was being celebrated. So began the Vengeance Pact among the highprinces of Alethkar and the War of Reckoning against the Parshendi. Now the Assassin is active again, murdering rulers all over the world of Roshar, using his baffling powers to thwart every bodyguard and elude all pursuers. Among his prime targets is Highprince Dalinar, widely considered the power behind the Alethi throne. His leading role in the war would seem reason enough, but the Assassins master has much deeper motives. Expected by his enemies to die the miserable death of a military slave, Kaladin survived to be given command of the royal bodyguards, a controversial first for a low-status darkeyes. Now he must protect the king and Dalinar from every common peril as well as the distinctly uncommon threat of the Assassin, all while secretly struggling to master remarkable new powers that are somehow linked to his honorspren, Syl. Brilliant but troubled Shallan strives along a parallel path. Despite being broken in ways she refuses to acknowledge, she bears a terrible burden: to somehow prevent the return of the legendary Voidbringers and the civilization-ending Desolation that will follow. The secrets she needs can be found at the Shattered Plains, but just arriving there proves more difficult than she could have imagined. Meanwhile, at the heart of the Shattered Plains, the Parshendi are making an epochal decision. Hard pressed by years of Alethi attacks, their numbers ever shrinking, they are convinced by their war leader, Eshonai, to risk everything on a desperate gamble with the very supernatural forces they once fled. The possible consequences for Parshendi and humans alike, indeed, for Roshar itself, are as dangerous as they are incalculable. 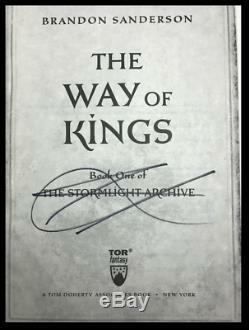 The doors of the Stormlight Archive first opened to us with The Way of Kings. 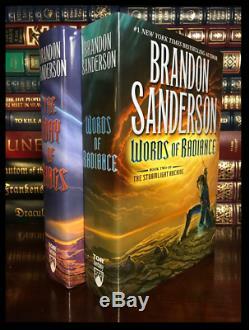 Read that book now available in all formats and then Words of Radiance , and you can be part of the adventure every dazzling step of the way. 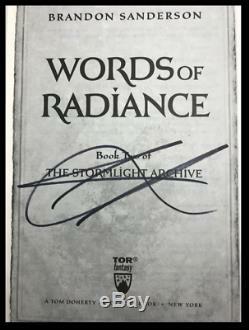 The item "Stormlight Archive BOTH SIGNED by BRANDON SANDERSON Way of Kings Word Radiance" is in sale since Thursday, December 7, 2017. This item is in the category "Books\Antiquarian & Collectible". The seller is "readwhiteandblue" and is located in Dallas, Texas. This item can be shipped to United States, Canada, United Kingdom, Denmark, Romania, Slovakia, Bulgaria, Czech republic, Finland, Hungary, Latvia, Lithuania, Malta, Estonia, Australia, Greece, Portugal, Cyprus, Slovenia, Japan, Sweden, South Korea, Indonesia, Taiwan, South africa, Belgium, France, Hong Kong, Ireland, Netherlands, Poland, Spain, Italy, Germany, Austria, Israel, Mexico, New Zealand, Philippines, Singapore, Norway, Saudi arabia, Ukraine, United arab emirates, Qatar, Kuwait, Bahrain, Croatia, Malaysia, Brazil, Chile, Colombia, Costa rica, Dominican republic, Panama, Trinidad and tobago, Guatemala, El salvador, Honduras, Jamaica, Antigua and barbuda, Aruba, Belize, Dominica, Grenada, Saint kitts and nevis, Saint lucia, Montserrat, Turks and caicos islands, Barbados, Bangladesh, Bermuda, Brunei darussalam, Bolivia, Ecuador, Egypt, French guiana, Guernsey, Gibraltar, Guadeloupe, Iceland, Jersey, Jordan, Cambodia, Cayman islands, Liechtenstein, Sri lanka, Luxembourg, Monaco, Macao, Martinique, Maldives, Nicaragua, Oman, Peru, Pakistan, Paraguay, Reunion.